Splitting enough wood for the stove. watching out for bears on my way home. And AT home. Reading the tracks on the main trail to see who has been passing by, human and animal. At home there are no plugs because there is no electricity. It surprises me sometimes how foreign this concept can be to others. Last year I was at the state fair and passing by a booth where a nice young man invited me to enter a drawing for a snazzy flatscreen TV or a dishwasher, or something, I forget. I said that I couldn’t use that prize because I don’t have electricity. This fellow was not stupid, yet my statement made him momentarily act it. He got a blank, confused look, and then said “You mean, like, you don’t have cable?” I think it was simply the first thing that came into his mind that would impact his world if he didn’t have electricity. The absence of things more basic, like lights and running water was beyond imagining, at least for a moment until his brain began to belatedly process the idea. When he did process it, he was fascinated. He began to ask a lot of questions. He was new to Alaska and had never in his life met anyone who lived without electricity. We talked for a bit. Then, just to see him get that look again, I told him it was not possible to drive to my house. internet access, and I don’t mean dialup – I’m no savage! For now I get my internet mostly in town, and on my iphone at the cabin. Eventually I plan to have a solar panel and a satellite dish for internet at home. I really enjoy the mixture of high-tech and no-tech. I have had conversations similar to the one above, but in the opposite direction. “You can send videos overseas from your dogsled?” Yes, I can. As long as I’m in cell range. I had a fun telephone call with a friend earlier this winter. We were discussing some details of a web project that we were collaborating on. Several minutes into the conversation, I suddenly said “Gee!” loudly – That’s the command for lead dogs to turn right. He laughed and asked where I was. 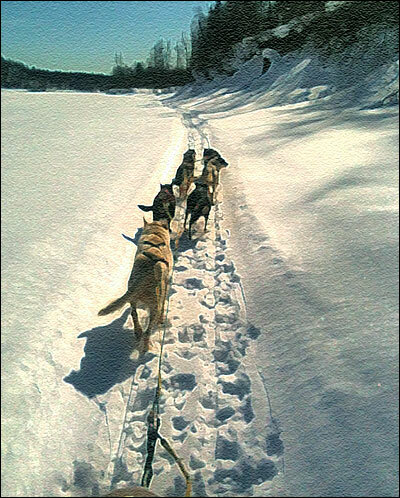 I said I was out on the Susitna River about 10 miles from my cabin, running my team. And I already knew he was at his remote homestead, six miles from the road, talking to me via a cellular signal, using his laptop and Skype. The plan for this blog is to focus on the unplugged aspects of my life, and on the fun sweet-and-sour mix of being unplugged yet connected. Because the scumbags of the world make it necessary to use an anti-spam program, please copy the numbers below into the box provided before submitting your comment.